I am pretty much an outdoors type person which means I spend less time in my kitchen during the summer. I still have to eat, so if I am not grilling I tend to prepare dishes that take less to prepare. Also, during the summer I tend to use a lighter or thinner gravy or sauce. I plan to do a series of dishes that take less preparation time or allow you to spend cooking time outside. I saw a segment on the Food Network for a similar recipe several months ago. Typically, some type of Louisiana shellfish (crawfish, shrimp or crab) is used to make etouffee. Guy Fieri was visiting a restaurant somewhere in the heartlands that featured some type of chicken etouffee. I suspect the dish was created due to the lack of fresh seafood. I created this version recently and thought it was good enough to share with y’all. The base ingredients for etouffee are usually onion, bell pepper, roux and broth. I have more complex bases for etouffee, but remember it’s summer so I am keeping this one simple. There are a thousands of base recipes, so if you have a favorite use it. I happen to be a fan of smoke flavor, so I added a few chicken thighs and andouille sausage to the smoker this weekend. I usually load up the smoker with meat when I fire it up. I figure why not use all the space, it takes the same amount of heat and smoke. Season the chicken with creole seasoning. Smoke or grill the chicken thighs until done. (This can be cooked ahead of time or as I mentioned, use leftovers). Leave 6 thighs whole and chop up the rest into bite size pieces. For the rice, bring 1 cup of water, 1 cup of the chicken stock, two bay leaves and few dashes of creole seasoning to a boil. Add the rice, when it comes back to a boil stir, cover and set burner to lowest setting. Remove from heat when the water is gone. Melt half the butter in a saucepan or high sided skillet. I like a black iron pot. Add the onions and bell pepper and sauté until clear, add the andouille. When the andouille is heated up and begins to brown, mix the powdered roux into the pot. Once all is mixed well, add the remaining butter. When the butter has melted add the remaining 3 cups of broth one cup at a time. Stir well as you add the broth. Add the two bay leaves. Let this slow simmer at least 15 minutes. Remove the pot from the heat and add the 6 whole thighs to the etouffee. Let the chicken and etouffee swap flavors for 5 to 10 minutes. Spoon a serving of rice into a bowl. 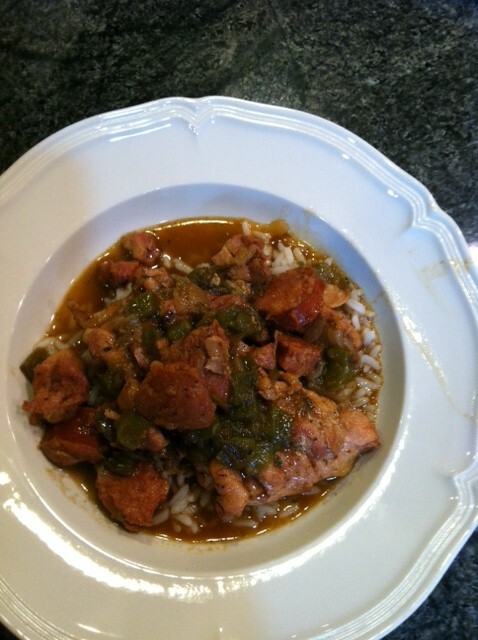 Place a whole chicken thigh on top of the rice, then spoon the etouffee over the thigh and rice.